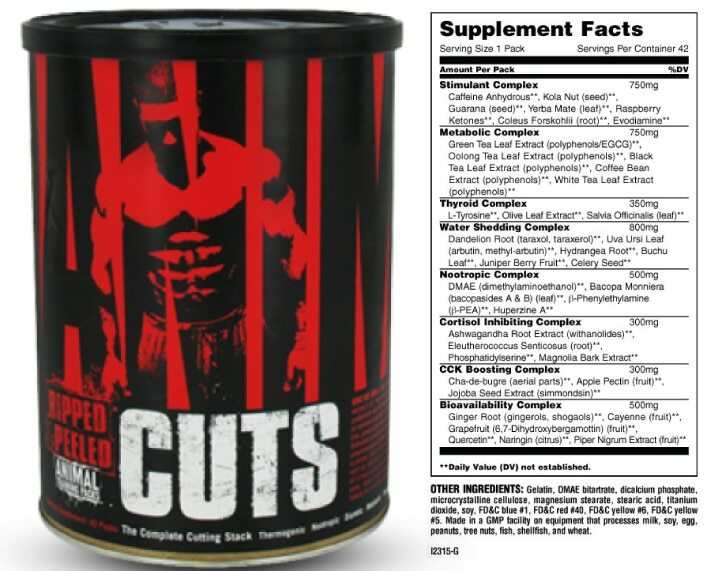 Animal Cuts Reviews, Results & Side Effects: Read Before You Buy! Animal Cuts Reviews: Fat Burner & Nootropic In One Supp? Touted as a ‘Complete Cutting Stack’ and advertised as a combo thermogenic, diuretic and metabolic booster, from gorilla marketing to a Muscular Man in Blood red on the Package, as well as, Massive Body Builder Men displayed on the website. Animal Cuts is the New Hype in town whether you are a competitive bodybuilder, fitness guru, athlete, or if you are just trying to trim up and look fit, is it worth buying? Is the product really good? Here is a comprehensive review of the product, and why you should give it some consideration. Animal Cut manufactured by Universal Nutrition, is a Thermogenic weight loss product, an extreme weight loss supplement/ fat-shredding formula designed to help you burn more calories and shred away body fat within no time by increasing body temperature and raising metabolism. The formula is made for athletes and bodybuilders, or those who take their workouts, fitness goals, as well as, dieting serious, with potent ingredients that deliver. 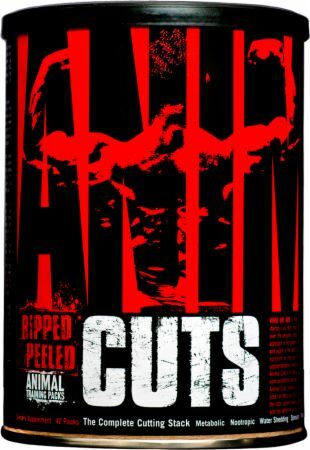 Animal Cuts, branded the ‘complete cutting stack, with a ‘peeled and ripped’ effect, has a resilient presence of stimulant-based ingredients alongside thermogenic component targeting fat deposits in the body in multiple ways such as a thermogenic, diuretic and metabolic booster. Thermogenically Animal Cut is extremely potent, Thermogenesis is the process of burning calories in stored body fat which in turn increases the core body temperature and thusly providing an ample supply of usable energy to the whole body while sparing body muscles (Lean Mass). Metabolically, Animal Cuts is amassed with the most potent of compounds, from; Green tea extract, to white and Black tree Extract, not forgetting Oolong Tea, all are covered here. All these compounds necessitate faster metabolism which equates to efficient fat burning and fewer calories remaining as body fat. Diuretically, Animal Cuts is tremendously efficient when it comes to removing excess under the skin water stored weight, and unlike most diuretics plagued with depleting body key electrolytes such potassium which makes muscles lose their mass and pump, Animal Cuts moreover contains potassium-sparing herbs helping preserve muscular fullness. Additionally, Animal Cuts recognizes that Dieting can be a stressful endeavour resulting to the release of ‘Cortisol’ a stress hormone. It’s worth noting that high levels of Cortisol are potentially disastrous, wreaking mayhem on natural hormone production, which actually eats away lean muscles, a devastating effect indeed. But Animal Cuts has an inbound cortisol inhibiting complex patented as SerinAid designed to help blunt production of Cortisol, allow your body to stay at the optimum anabolic environment. Finally, Animal Cuts incorporates three crucial components in its potent formula the first being Nootropic Complex. An integral brain boosting ingredient designed to articulately help maintain brain chemistry allowing for focus and heightened alertness during a workout, as well as, amplified oxygen supply to the brain increasing neurotransmitter and neuromuscular, output and performance. The Second being CCK boosters which serve as appetite suppressants. Animal Cut comprises of natural sugar and card reducing ingredients, helping you keep a clean diet while ‘Munchies’ are held at bay. And Lastly, Animal Cuts have compounds included designed to deliver active ingredients more effectively, termed as the bioavailability complex with natural compounds such as Quercetin, Gingerols, Naringin, 6,7-dihydroxybergamottin, and shogaols used for this purpose. Diuretically Addresses water retention – Animal Cuts is efficient in shedding water weight stored under the skin while keeping close regulation not to depleting key body electrolytes such as potassium by replenishing them. Enhances Lean Mass Preservation – Animal Cuts has inbound cortisol inhibiting complex patented as SerinAid designed to help blunt production of Cortisol, allow your body to stay at optimum anabolic environment. Animal cuts constitutes of eight key distinct complex ingredients/ components designed to successfully help eliminate fat from the body. Burns/ Shreds fat deposits by raising the core temperature of the body. Thermogenic Complex ingredients include Kola Nut, Yerba Mate, Caffeine Anhydrous, Guarana, Raspberry Ketones and Cocoa Extract. Responsible for converting into energy, thus increased energy for cardio and training. Metabolic Complex ingredients in Animal Cuts include Black Tea Extract, Green Tea Extract, Coffee Bean Extract, and Oolong Tea Extract. Causes the body to shade water weight stored under the skin. The Diuretic Complex ingredients include Juniper berry, Dandelion root, Celery Seed, and Astragalus. Alleviates maintenance of proper brain chemistry and focus improvement. Example of Nootropic Complex ingredients includes Monniera, Bacopa, Bitarte, and Cocoa with beta Phenylethylamine. Aids in reduction of food cravings/ appetite suppression. CCK inhibiting Complex rich ingredients include Psyllium Seed Husk and Cha-de-Bugre. With so many pills to take throughout the day, the Colour Coding Scheme implemented that you don’t have to take every one of the pills if you don’t want to. For example, if the Diuretic pill makes you have urges to visit the bathroom all too often, then skip the blue pill. Or if the Thermogenic one is a culprit of giving you hot flushes, then don’t take that pill. Animal Cuts’ colour coding scheme gives room for customization to your preference. With the Caffeine concentration in this Fat Burning Stack being potentially too much especially for sensitive people, it is advisable to try out the product in small dosage, and then increase gradually. With so many different ingredients incorporated in creating the batch, another big drawback of Animal Cuts is the Potential for side effects. Common ones include Nausea, Mild Headaches, Occasional Hot Flashes, Lots of Sweating, as well as, feelings of Fatigue and Weakness. With so many ingredients incorporated in the production of Animal Cuts, there are side effects that come with the benefits as is observed with all supplements as you interact with them. Judging from online feedbacks some side effects case reported include Nervousness, Heartburn, insomnia, increased heart rate, Dry mouth, Headaches, Nausea, and Sweats. Anyone who may be particularly sensitive to caffeine may find the use of Animal Cuts Problematic. However, removing certain pills from the mix may help alleviate/ reduce the adverse reactions experienced. Additionally, following a healthy diet, and exercising may also reduce the intensity of the side effects experienced. Consumers/ Customers are generally happy and satisfied with Animal Cuts, with Animal Cuts reviews from Amazon among other online stores giving it ample credibility. From packaging the ingredients are is listed right on the product label for transparency. Qualities such as Mixability and Taste have been noted by customers as irrelevant since the products come in pill, more to advantage especially for people on-the-go. And last but least customer satisfaction rates are above average with some consumers/ customers reporting the loss of as much as five pounds of body fat at the end of each usage cycle. Animal Cuts is an Affordable and tremendously pills fat burner/ Shredder for Athletes, Bodybuilders, fitness guru, or if you are just trying to trim up and look fit. The product manufactured by Universal Nutrition, a reputable company with decades of experience, contains potent ingredients that guarantee results. Following the recommended dosage, with the integration of regular exercises, as well as, a healthy diet, you will not have to worry about the side effects. Of note is that first-timers may be advised to test out the product by taking smaller dosages and progressively increase their dosage as their body becomes accustomed to it. Additionally, it is not recommended for people with Inhibiting medical conditions or who are currently taking prescribed medication. However, it is worth noting that these side effects can be avoided by living a healthy lifestyle and being physically active. In conclusion, Animal Cuts is an outstanding fat burning/ Shredding option, but caffeine sensitive persons might be advised to stay away from in prevention of the potential side effects.